ZLIN (Panorama): Researchers in Zlin and Molde have contributed to a monograph that is soon to be published, titled «The Social Economy, Social Enterprises and outline of sustainability». In January 2016, Molde University College received an invitation from Tomas Bata University in Zlin (Czech Republic), applying for a grant from the European Economic Area (EEA) Grants and Norway Grants. Olav Hauge was quick to accept the invitation. The focus related to this grant was to build a research team in the field of social economy (the third sector) as sources of sustainable economic growth of post-industrial European regions. Hauge was very positive towards new cooperation and could see the future outcomes of it. In June, some of the staff and PhD students from Tomas Bata University in Zlinb visited our university in Molde, as a first step to writing a joint monograph. Hauge was in charge of it, and the group was interested in seeing how the social economy worked in Møre and Romsdal. Among other things, Hauge brought them to kindergarten section in Molde kommune and Astero to show the work being done there regarding social economy, and the benefits for the Molde region. Due to many non-predictable events, the planned visit from Molde University College to the Czech Republic was rescheduled several times. 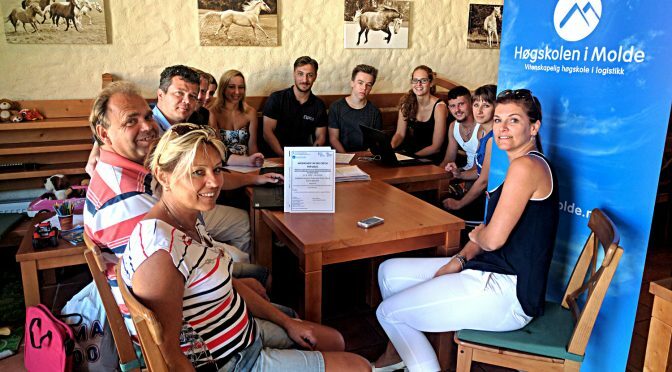 Eventually the universities agreed on meeting for a new workshop in September, and Dean Oskar Solenes and I had the pleasure of meeting the group from Tomas Bata University – in Zlin. We also got a tour of the medical bed producer Linet, which is located in Želevčice. There, we walked around the production lines to see how Linet has adapted the Lean principles, like Six Sigma, 7 Wastes, and Kanban. The fabric was big, and our visit lasted much longer than we expected it to, but I have to say that it was an interesting walk around the factory. The universities plan to send a new application to the EEA for a new grant for future collaboration involving exchange of academic staff and PhD students, but this time around the academic cooperation will move on to logistics.